There was a time when I was really angry with God for creating humans in the first place. What was He thinking? If He really is omniscient, knowing everything, then He knew we were going to turn away from Him in the garden and go our own way (Gen. 3). He knew Satan and his angels would rebel and be hurled to the earth, where they would wage war against us (Rev. 12). If God knew that we would rebel and that we would spend our lives tormented, battling an invisible army, why in the world did He create us in the first place? Are we just pawns in some sort of cosmic chess game? Are we here for His entertainment, like the gladiators of ancient Rome? Or was I completely mistaken? Was there something else motivating Him? He had perfect community within Himself: Father, Son and Holy Spirit. One being, three persons, in perfect and loving communion, submitting to One Another from the beginning of time, extending out into eternity. Why mess with perfection? But we hold that baby in our arms, we gaze into each others’ eyes and we know. Yes, there are challenges and they are great. But the triumphs are even greater. Simple things – the smiles, the coos, the first time they sleep through the night. First teeth, first steps, the first day of preschool. It has been said that there is no greater frustration and yet no greater joy in life than parenting. I think God feels that way too. In that time that I was so angry with God, I do believe I was completely mistaken. And, regarding God’s true motivation, I believe I received my answer. He had perfection in and of Himself, but He wasn’t looking for perfection. I think that’s why He doesn’t expect perfection from us. He already has that. He wanted to be a parent. He wanted to expand His family, just as a family with one child or two decides they would like to expand their family. “We have room in our hearts for one more.” God always has room in His heart for one more. That’s Fezzik plopped on top. Aren’t they sweet? I was talking to my brother the other day about his cats. 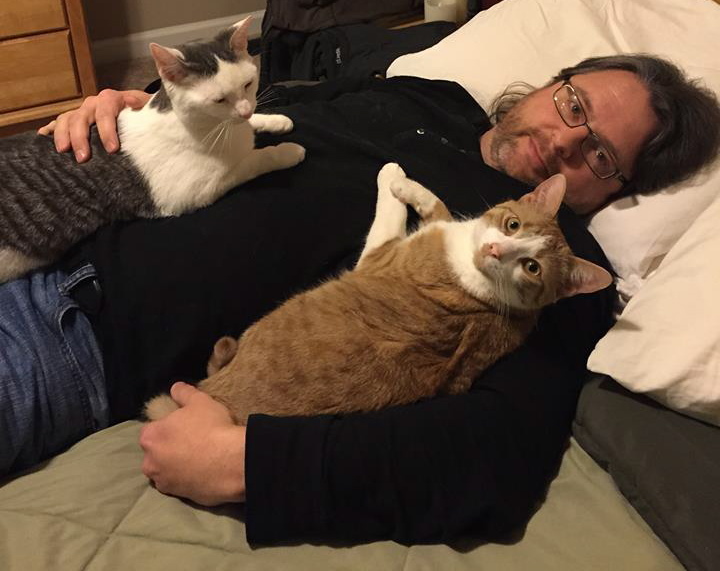 He and his wife don’t have human children, but they have an expanding family of cat children. They’re now up to four. The latest member, Fezzik, has come complete with one challenge after another. Rick was sharing with me the ups and downs of the latest challenge, which ended up affecting everyone in the household and their pocketbook. Definitely not something they planned on. Rick stopped and said, “You know, even with everything we’ve gone through with Fezzik, he’s totally worth it. He’s so sweet. And he just checks in. He comes in, plops down on me and hangs out for a little while. He’ll leave for while, but sure enough, he’ll be back again to check in.” I could hear Rick grinning from ear to ear through the phone as he talked about his beloved and sweet little cat. I got to thinking. If a human being feels that way about a cat, imagine how God must feel about us. Imagine God chatting with Jesus: “You know, even with everything we’ve gone through with _________, they’re totally worth it. They’re so sweet. And they just check in.” Put your name in that blank. Can you see God grinning from ear to ear as He talks about His beloved and sweet child? That’s you. If you haven’t checked in with Him in a while, maybe right now is a great time. IT SURE IS WORTH IT. Thank you Lord for my children, my husband, my dog, AND for the love that God has for ALL of us. Thank you for my amazing children and their “gifts” given to them by God. How very blessed I am. I can’t imagine my life without them. Amen.